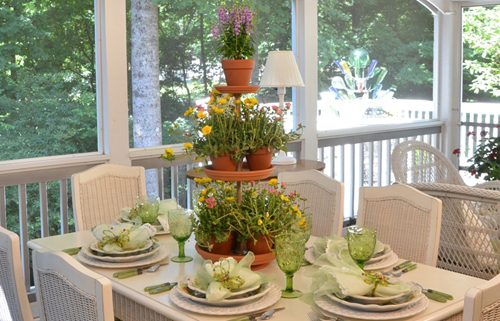 We saw this DIY project on how to make a tiered planter from terracotta saucers and had to share it here. Because the instructions are a bit detailed, not complicated we will share a link below on the complete instruction sheet. When you entertain in your home and are always looking for new and clever ideas, we think this one will fill your need. 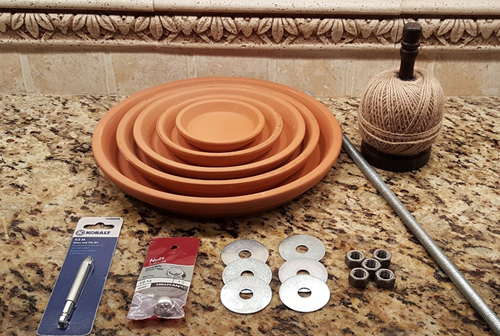 By taking a few clay saucers and some nuts and bolts you can create this multi tiered pot stand. Placed in the center of a dining room table, on a buffet table or a garden table it is stunning and commanding. Place some plants potted in terracotta on the stand and create different looks to compliment the different seasons. Use this for Halloween and fill the pots with treats, use as a cupcake stand, and during Christmas fill the pots with candy canes and red & white plants. Stunning! Remember all you will need are terracotta clay round saucers, clay flowerpots with flowers and a few other items.